The second in the series on poisons looks at cyanide, another notorious agent of murder. It’s played a role in genocide, in suicide pills, and is also found in small amounts in the seeds of numerous fruits. 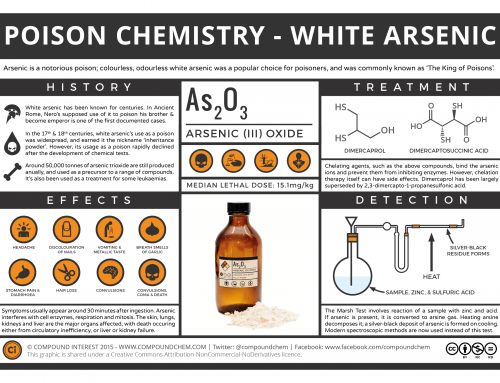 So, why is cyanide so poisonous, and why are deaths from cyanide poisoning less of a rarity than those from arsenic poison in the modern day? 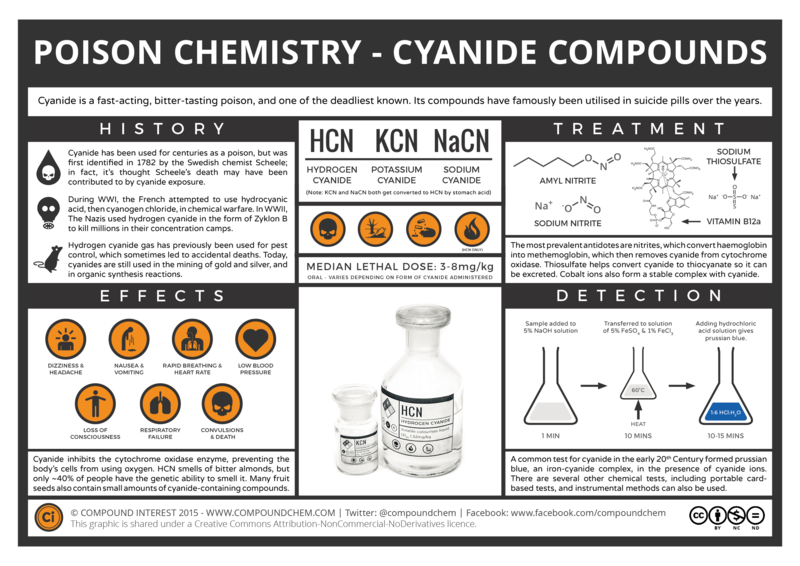 Cyanide is the CN– ion, and as a poison it is commonly administered as one of the three compounds shown in the graphic: hydrogen cyanide, a volatile, colourless liquid, and potassium and sodium cyanide, both white powders. Both potassium and sodium cyanide react with stomach acid to produce hydrogen cyanide, which can then go on to cause toxic effects. Though cyanide has been used as a poison for centuries, it was first isolated in Sweden in 1782, by Swedish chemist Carl Scheele. Whilst different sources tell different stories, some claim that the exposure to cyanide was a contributing cause to Scheele’s early death at the age of 43. Scheele’s early death isn’t surprising considering considering the number of toxic agents he worked with throughout his career. He was also the first person to note the bitter almond smell of hydrogen cyanide – a smell which, it turns out, can only be detected by 40% of people for genetic reasons. So, what happens when a person is poisoned with cyanide? 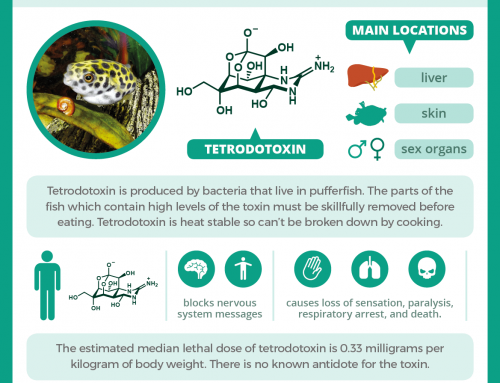 It’s one of the fastest acting poisons known, and if a significant amount is ingested, it can lead rapidly to death. Upon ingestion, it binds to haemoglobin, the molecule in red blood cells responsible for carrying oxygen to the cells in our body. Haemoglobin then ferries it to the body’s tissues, where it can bind to an enzyme called cytochrome oxidase. This enzyme is a vital tool cells require to make use of oxygen, and with cyanide bound to it, they are unable to do so. The symptoms of cyanide exposure are seen rapidly, and include headaches, nausea, vomiting, and elevated breathing and heart rates. With a suitable dose, these symptoms can quickly progress to loss of consciousness, respiratory failure, and death. The exact dose that causes death depends on the form of cyanide administered, but lethal doses as low as one milligram per kilogram of body weight have been reported. Cyanide poisoning can also come from unlikely sounding sources. One study tells of a woman who ate 20 apricot kernels, and was subsequently afflicted with cyanide poisoning. Apricot kernels, and seeds of other fruits such as apples and peaches, contain a compound called amygdalin, which contains a cyanide portion. When this compound contacts with the acid in the stomach, hydrogen cyanide is produced, which can then lead to poisoning. Luckily, a significant number of fruit seeds are required to reach a lethal dose of cyanide – the woman mentioned in the study made a full recovery. Perhaps the most well-known use of cyanide as a poison was in the Nazi concentration camps of World War II. There, the Nazis used Zyklon B, a cyanide-based pesticide which released hydrogen cyanide, to kill millions. Cyanide was also involved later in the war; though it’s commonly thought that Hitler committed suicide by shooting himself in the head, evidence has suggested that he in fact killed himself via use of a pill containing potassium cyanide, along with his mistress Eva Braun. Cyanide poisoning is still a not-uncommon occurrence, though the exposure is often accidental. In particular, plastics such as nylon and polyurethanes release cyanide when burnt, so during fires cyanide poisoning can often occur. In 2009, a Russian nightclub fire killed over 150 people, and a number of these deaths were thought to be as a result of the inhalation of cyanide and other toxic gases produced by burning plastics. As cyanide is such a fast-acting poison, it can be hard to administer any antidote in time if a lethal dose has been ingested. There’s no universally agreed method for treating cyanide poisonings, and different treatments are favoured in different countries. Nitrite compounds are commonly used; these transform haemoglobin into methemoglobin, which cyanide will bind to preferentially instead of the cytochrome oxidase enzyme. However, as methemoglobin does not carry oxygen, it must in turn be treated with methylene blue. 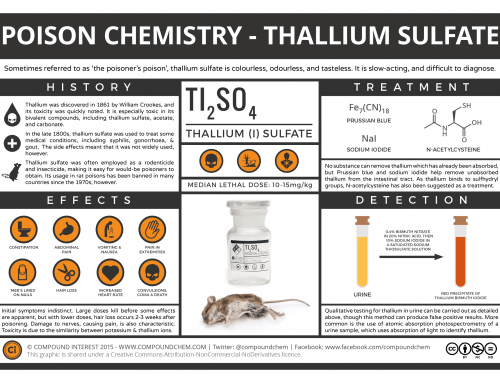 Thiosulfates are commonly administered in combination with nitrites, as they help convert the cyanide to thiocyanate, which can then be eliminated from the body in the urine. Other compounds that can also be used include cobalt-containing compounds, as cobalt forms a complex with cyanide ions. However, these cobalt compounds also have the disadvantage of being highly toxic themselves. Vitamin B12a has also been used, which can bind the cyanide to form another harmless form of vitamin B12. As mentioned, cyanide is fast-acting, and some cases, too fast for administration of an antidote. After death, cyanide poisoning can be detected in a number of ways; today, instrumental methods can be used, but there is also a simple, lab-based test. A tissue sample is added to 5% sodium hydroxide solution, which is in turn added to a solution containing 5% iron (II) sulfate and 1% iron (III) chloride. This is heated to 60˚C for 10 minutes, then transferred to a solution of hydrochloric acid. The appearance of a blue colouration, caused by the formation of the iron-cyanide complex known as Prussian blue, indicates the presence of cyanide ions in the original sample. Despite the ease of detection, occasional murders through cyanide poisoning still occur. In Chicago in the 1980s, capsules of paracetamol (tylenol in the US) were spiked with potassium cyanide by an unknown perpetrator, leading to several deaths. More recently, in 2012, Chicago was again the site of a cyanide murder. Lottery winner Urooj Khan died shortly after collecting winnings of almost half a million dollars, and though his death was originally thought to be from natural causes, later autopsy revealed he had ingested a lethal dose of cyanide, though again the perpetrator remains unidentified.